Mt Lassen. I love the groundcover in the foreground; it was like walking in a deep shag carpet. Lassen Volcanic National Park lies about 2 hours south of Lava Beds NM. 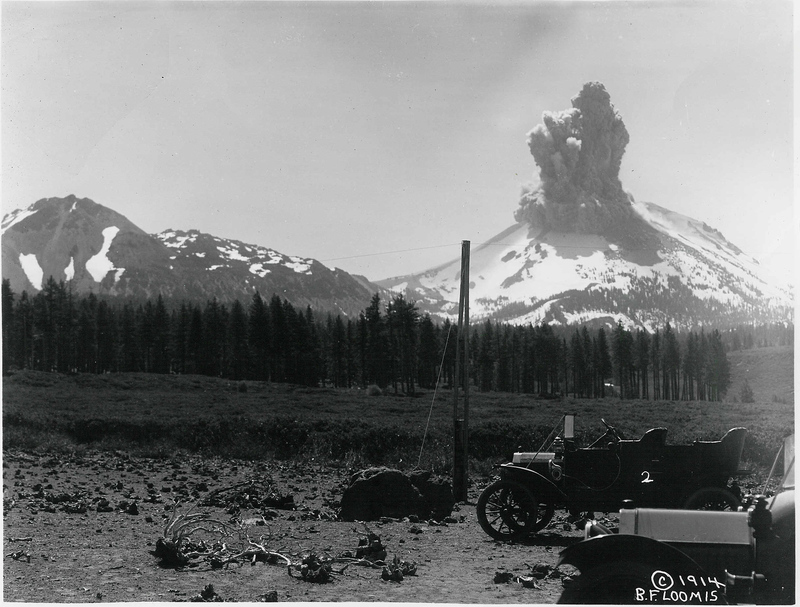 It’s formed by the earliest recorded volcanic explosion in American history; the Lassen volcano erupted in 1915 and was caught in a series of great photographs (great in part because of the period car in the foreground). South of Lava Beds lies Modoc National Forest; it’s a scrabbly forest and the roads were in a wretched state of repair. Thankfully they were basically empty; for the worst potholes I swerved over to the other side of the road. Then it was along the highway and through another national forest to Lassen, which was about 2 hours away. The other national forest was being logged (this is relatively common), and there were orange ribbons tied around many trees near the road indicating that they were the next targets for chainsaws. I knew little about Lassen before arriving. In many cases, actually, I arrive at these parks with little information, so after passing through the entrance station I usually pull over and examine the map, trying to find the closest visitor’s center. On my stop here, I asked for advice on a few hikes and found two 5 mile hikes and one 12 mile hike. The peak from the parking lot. Doesn’t look so bad, right? Mt Lassen itself is an utterly charmless pile of rubble and sand. It towers 10,400 feet, far above the other nearby mountains. After the eruption of the volcano, the park was quickly designated a national landmark. Like all the rest of the volcanoes I’ve visited, this one remains dormant, which means that it could become active again! It’s surrounded by the remains of the last eruption; there’s also a system of hot springs and fumaroles, and a variety of lakes, forests, and other outdoor activities. Many of the hikes are quite long; the road spans the western part of the park and a web of trails lies on the east, making it a great location for long backpacking trips. I saw several groups setting out during my stay. Although the park is crowded, the summer rush was just starting to tail off. Between the forests and various geological features, I found the park closely resembled Yellowstone. Instead of geysers, it had a mountain, but much else was the same. I consider it a better Yellowstone, myself, because I preferred the forests and fumeroles here to those I saw at Yellowstone (fewer people was also a plus). Visiting on a lucky Sunday, the trail to the summit was open. It’s closed most of the time, I guess to protect vegetation. So, starting around 2 pm I began my hike up Lassen. It’s 2 miles up and 2 miles back, and the hike consists almost entirely of switchbacks on loose rock. I was nervous because of the altitude and my experience in the Grand Tetons, where I reached only 9700 feet – 700 feet less than I’d reach here. Although the hike was a challenge and I was out of breath for the duration, I was happy to cover the 2 miles and 2000 feet of elevation gain in an hour’s time. The only problem was how dull the hike itself was – the treeline was left behind only a mile into the hike and it was only endless switchbacks from there. Unlike a elementary school science project, there wasn’t any ‘cauldron’ at the summit, but general disarray. There was a small, semi-flat area and various peaks and lumps around it. I climbed up one section of rock and had a snack. Surprisingly, there’s always bugs at these altitudes, usually bees. There were also mountain chipmunks – similar to a regular appearance, but much broader and with a stubby tail. The hike itself was extremely popular and quite crowded, even on a Sunday afternoon. The problem with some of these hikes – I’ve noticed this particularly for marquee hikes in these parks, such as Skyline loop in Rainier – is that much of the crowd has done little hiking before and the common courtesies that are commonplace on most trails are not observed. I guess the same way courtesies in a small town don’t exist in the city. People don’t hike on the right side of the trail, span the trail in groups, don’t step aside to let those ascending pass, and don’t acknowledge you on quieter sections of the trail. It can make for a frustrating hiking experience. Resident at the peak. My boot is visible in the lower right. He was less than a foot away! After the climb I was pretty worn out, but decided to do another short hike, this time to see some of the geological features, which situated in a section of the park known as ‘Bumpass Hell.’ Apparently they were discovered by a Mr. Bumpass, who promptly slipped and burned his leg in one of the springs. I was hoping against hope that this would be a flat portion of the trail; I quickly found that it wasn’t, and that hiking at altitude had used up quite a bit more energy than I had expected. Thus, this 7 mile hike turned out to be more grueling than I’d anticipated. It was worth it, though, as finally after curving around a few mountains I reached Bumpass Hell. I actually took the long way, as I’d told the ranger I liked hiking. Still, it was fairly isolated and there were only a few people; a far cry from the Times Square feel of Yellowstone. Like all hot springs complexes at the National Parks, this one featured a boardwalk to keep you from boiling or burning yourself. Bumpass Hell hot springs and fumaroles. Boardwalk on the top to prevent boiling oneself. Unlike Yellowstone, which has many geysers and a variety of small pools, this complex had much larger features and fewer of them, something I found more impressive. Springs and fumeroles are notorious for their ‘rotten eggs’ smell, caused by sulfur (which I don’t mind much), which was absent here; this time it was more of a ‘scorched rotten eggs.’ Much worse! I enjoyed the area despite the smell. It was quiet and the mudpots were impressive; Bumpass Hell was ringed with mountains and the end of the nearby trail I’d climbed was parched yellow and white. The sun was setting and I wanted to stay longer, but I had to get back to the van. Hills next to Bumpass Hell. The trail wound down from these. In all I climbed, according to my pedometer, the equivalent of 355 flights of stairs, and hiked about 12 miles. I was pretty happy about this. Thankfully, I also now had a Coleman stove and so was able to do some real cooking (at least as real as possible without much refrigeration), making myself an omelet for dinner. The next morning I set out early on the 12 mile loop that was recommended by the ranger. The highlight of this was supposed to be ‘Corral Meadows,’ which was reputed to have wildflowers. Still suffering from second-day soreness from the previous hikes, I took it slow. The start of the hike was great – some nice views of Lassen and interesting forests, covered with a single kind of groundcover. After that, though, the wilderness began to look similar to the landscape in southern Oregon, and when I reached the ‘meadows,’ I never saw any flowers, or anything particularly interesting. Furthermore, a few broad streams weren’t bridged very well and I slipped into the water, soaking my shoes and one leg. At least my camera stayed dry. By the time I returned to my car, the shoes were mostly dry but were caked with a layer of mud. I left the park that afternoon, happy with my stay, and headed to a laundromat to wash my clothes (and shoes! ), and then head due west to Redwoods National Park. This entry was posted in Periodic Update on August 30, 2013 by rob. Crater Lake is one of the ‘major’ national parks – similar to Yellowstone, Rainier, and Grand Teton, with the amount of visitors you’d expect. At the park, I saw more east-coast license plates than I had in all of Washington: 3x NY, NJ, Connecticut, Massachusetts. Maybe it was just a coincidence. Crater Lake was an enormous mountain (Mount Mazama) until 7,000 years ago, when it blew up and the caldera filled with water. The lake that formed is the deepest in the US (1940 feet! ), and has the clearest water in the world – 143 feet of visibility. It’s big, 20 miles around, but not that big. The rim itself is very steep, and the water can only be accessed from one location in the park; from below the rim it’s impossible to tell that there’s a lake, which is why it was discovered very late, by a gold prospector. The park was crowded – particularly the camping areas – but not nearly as overrun as Rainier. The roads, however, were worse. Here I saw my first ‘negative shoulder’ roads, where the white shoulder line had been eaten away by erosion. I don’t begrudge the park service: there are serious budget cuts and one campground was even closed. The fundamental problem is that a lot of the topsoil in the park is sand. Imagine building a sand castle and letting it dry out, then building a road on top. As the sand crumbles, chunks of the road are taken with it. Make the walls of the sandcastle 200 feet high and you have some idea of driving along the rim here. The roads are closed in the winter, too, because there can be up to 20 feet of snow. They have big poles near the road so snowplow drivers can see where to plow. After arriving I secured a site ($29, because I had to get an RV site!) and went on a hike. 11 miles, up to a nearby mountain, Union Peak. This hike also featured about 4 miles of hiking along the Pacific Crest Trail. It was moderate, and I enjoyed looking around and comparing the plants with those 100 miles away near the coast. The final mile of trail before the peak, however, turned into the most frightening hike I’ve been on so far: steep rocky scrambling and the ground was loose sand that frequently gave way under my feet. Parts were actually all a large gravel which, geologically, is known as talus. I discovered the peak was already occupied by an older guy from Alaska for a while. He looked like a born runner and he’d hiked 1,000 miles on the Pacific Crest Trail… before having to give up because his hips couldn’t take the weight of the pack. Now he was mostly doing day hikes along the trail. I didn’t realize how old he was until he mentioned that he’d last visited Yosemite in 1972! He gave me some recommendations about parks I should visit, before heading back down. I visited the park at the same time that PCT hikers were passing through, and I always saw them congregating near the post office, eagerly digging through their resupply packs and availing themselves of the showers. Looking down the trail at a switchback (several subsequent switchbacks are visible below). The start of the climb is visible in the upper right. The view from Union Peak would have been good, except there was intense smog. Apparently local forest fires (about 100 miles away) were filling the air with this smog, and it seriously impinged on visibility. Additionally, I had trouble even picking out Crater Lake among the other mountains, as the water was not visible from the summit’s angle. There’s a lot of bikers in the National Parks, and frankly the biking that they do feels like a form of insanity. I don’t mean because of the extensive hills. Rather, people drive quite fast on these roads with no shoulders, and biking on some of these roads seems really dangerous. One of the rangers at Crater Lake said there were 2-3 bike ‘incidents’ per month. I don’t know how severe that is, but I guess it’s less than I expected. Still, I’ll stick with hiking. The PCT here was a flat, easy hike, but the trail went through miles of land that had been hit with forest fires. What’s unexpected about fires is that they leave residue for decades, charred wood still visible, and although many trees are killed by the fire, they remain standing as their bark peels away and the wood bleaches in the sun. It was eerie walking through miles of this, with no living trees in sight. It also made for slow hiking, as this part of the trail was covered – the dead trees got knocked over the trail by winter storms. After I reached a spur trail that looped back towards my starting point, I ran into a group of 5 rangers clearing the trail. They weren’t using chainsaws, just axes and handsaws, which was a shock to me. It must have been tough work. They also didn’t seem aware of the state of the PCT; when they asked me how it was, I could tell they weren’t excited about clearing another 2 miles of trail (I didn’t say this, but I thought this section of the PCT was the worst-maintained trail I’d seen so far, long due for a clean-up). There’s a volcano in the volcano – Wizard Island. The water is exactly the same shade of blue as real life. This wasn’t a very exciting hike, for 10 miles, and long hikes for a few consecutive days, along with a 4 mile uphill slog, wore me down. The final stretch of trail was great, though – 2.4 miles right along the rim of the lake. At last, the smog had cleared up and I had real view of the water, which was jaw-dropping. I’d heard the lake described as “really blue,” and it was – it almost hurt to look at. I’ve never seen a shade of blue that deep and intense in nature before. There were numerous overlooks along this segment of trail which were invisible to the cars below, and it was basically empty – so it was a real treat. Altogether I covered 18 miles with a lot of climbing; this was the second toughest day of hiking for me after my 20-miler in Mt Rainier. This entry was posted in Periodic Update on August 20, 2013 by rob. Before I started my trip, I’d heard good things about the Oregon Coast, and I’m happy to report that it lived up to expectations. I wasn’t sure what to expect, but it turns out there’s a lot of diversity. I started in the evening, after fleeing the traffic of Portland. The coast isn’t that far away, and my introduction was the town of Astoria – a pleasant small town, reminiscent of Port Townsend, but on the Columbia River, across the border from Washington. The Columbia here is broad, about the width of the Mississippi in southern Minnesota. For whatever reason, the traffic was insane (at 3:30 on a Monday). I don’t know if it’s normally that way, or if there had been an accident, but it was the worst traffic jam I’d seen so far in the trip – about 2 miles that took 45 minutes to travel. My goal for the day was Fort Clatsop, which is another small National Historic Site. In this case, it was built once Lewis & Clark reached the Pacific Coast to serve as winter quarters before they headed back. The fort itself is miniscule, almost comically small, but the site has a decent museum and a good movie, and there were a reasonable amount of hiking trails: I did the “Slough to Sea” trail and then a trail to Nehul Landing, which is a former logging site near the coast. There were rows of old pilings there, and Oregon mountains in the background, but what stood out most was the blackberries – there were tons of them, all ripe for the picking. I must have eaten at least a pint, maybe two. Collectively I was able to log somewhat under 10 miles in this park. I spent the night at Safeway in the town of Seaside – awakened for a while as a street sweeper made its way around the parking lot, and then followed up with a leaf blower cleaning out the cart areas. They were very thorough, but the lodging was free so I can’t complain. I got up early and headed down the coast. Having seen little of interest during my half hour on the coast the previous day, I was stunned by how beautiful it was after I started driving. There’s a huge volume of campgrounds, picnic areas, scenic pullouts, boat launches sprinkled along the coast. On average, probably every 5 miles there was a beach to visit or state park. I picked a random one early on, as the sun was rising, to see what all the fuss was about. This beach really took me aback. Compared to the Washington beaches, which are a little sand, or all rocks, and NY beaches, which are just sand, this was incredible. There were seastacks in the water, as you might see at the famous Rialto beach in Washington. The beach itself was very flat, and stretched out forever at low tide. Cliffs rose nearby, some with little waterfalls flowing down. There were tidepools – the first tidepools I’ve seen recently that showed any sign of life. Mussels and barnacles I’d seen plenty of elsewhere, but there were also huge starfish, little roly-polys, brine shrimp, and small fish. ‘Island’ of trees. Who wouldn’t want to climb that? I continued on down the coast for a few hours before picking out another park. This one featured a large ‘island’ of rocks and trees above the beach, which I knew I had to climb. The beach itself was also nice, but not as good as the one I’d seen earlier. The trees were growing on a rock formation maybe 150-200 yards across and 50 yards deep; it was 150 feet high. Thee were a variety of trails leading into the undergrowth, many of them treacherous, a very steep grade with loose soil. Much of the climb was a ‘scramble’ – requiring handholds – but it was a lot of fun, and the panorama on top was worth the effort. There was a maze of narrow trails there, many partially closed in with vines and brush, and they opened up near the edge of the island for a view of the beach. I walked about 5 miles around these beaches before continuing on. My objective, which I reached around 1 pm, was a campground in the Siuslaw National Forest (perhaps the best National Forest I’ve seen so far on my trip). The location was called Cape Perpetua and was supposed to feature the best coastal view in Oregon. It was a well-run campground situated next to a small stream in a valley between two coastal mountains, with spotless bathrooms and great trails – the climb for the Mt Perpetua view was 830 feet of switchbacks in the forest; there was a WWII spotting station at the top. You could see the waves crashing against rocks below; when I visited them later they were covered with tidepools a constellation of tidepools. I also hiked to the local ‘Giant Spruce,’ which featured two stoners with a didgeridoo (conveniently left off the trail guide…), and then down to the ocean, covering an additional 10 miles on the day. That night I had my third campfire of the trip; this felt a lot more like a campground than some of the others I’d visited. In the morning I continued down the coast before crossing inland to Crater Lake. The roads here, in southwest Oregon, by the way, were a delight – highways with nice shoulders, reasonable drivers, good scenery, and just the right amount of turns to keep things interesting without being obnoxious. Between the two local National Forests – Umpqua and Siuslaw – and the myriad State Parks, I can definitely see myself returning to this area. This entry was posted in Periodic Update on August 19, 2013 by rob. Leaving Seattle, I headed to Port Townsend via ferry from Seattle (a 45 minute ferry ride and then 90 minutes of driving), to spend a week relaxing and preparing for the next leg of my journey. I’ve spent a lot of time in the town, enough that it feels in some ways like a second home; at least, it feels more like a home to me than NYC does. I love living near NYC and spending time there, but to me, it doesn’t feel like a “home.” Just a staging ground. Port Townsend has a population of just under 10 thousand people. It’s supported by a few industries: a paper mill, boat repair and production, and tourism. The town is on the very upper northeast corner of the Olympic Peninsula, so you see a lot ships headed back and forth into Puget Sound. Cruise liners, cargo ships, even warships and submarines cruise past. The town itself is composed mostly of restored Victorian buildings. Most of the homes are in many ways closer to cottages, because property near the center of town is quite expensive. Nonetheless these small homes feel quite roomy compared to an apartment! About 90% of homes are surrounded by tidy gardens, white picket fences, imaginative festive colors – the works (the other 10% have cars on cinderblocks and decaying Westphalias sitting in the front yard). Visiting in the summer, there’s a lot going on: nearly every week there are festivals (Jazz Festival, Wooden Boat Festival, Blues Festival, etc), and many bars have music from local bands 2 or 3 nights per week. However, if you don’t like antiquing, it’s easy to exhaust the downtown area in 2-3 hours. Luckily, Port Townsend has the best Thai food I’ve ever eaten (at “1-2-3 Thai Food”). I don’t say that lightly – Thai is my go-to cuisine and I’ll sample it whenever possible. The Pad Thai, Massaman Curry, Crispy Tofu – all excellent, and prepared for me at spiciness level 5 (out of 4!). I gorged myself every day. There’s some state parks in the area, which unfortunately aren’t all that imaginative. Most of them are on the beach, feature some forests and fields, and lots of old cement bunkers. Which are cool, and could be amazing, but they’re stripped down and typically covered with graffiti. This describes Fort Worden, Fort Ebey, and Fort Casey, all in the area. The water this far north is too cold to swim in, so mostly you sit on the sand, or fish. I must have seen two or three hundred fisherman and never once saw anyone catch a fish. The Climb, a first-person account of the ’96 Everest disaster (made famous by the inaccurate Into Thin Air). It’s a matter-of-fact book. I wouldn’t mind mountain climbing, myself, if I could acclimate to the altitude. One of the authors of the book actually climbed 7 of the 8,000 meter peaks without supplementary oxygen, including Everest 3 times. In light of my experiences at Grand Teton, this was incredible. At its summit, Everest has half as much oxygen as exists at sea level! Wild, a chick-lit book about a woman hiking part of the PCT. An enjoyable read, but I don’t find books about unprepared hikers stumbling around the woods particularly funny. On Wednesday and Thursday I took the ferry to nearby Whidbey Island, which has a few state parks and a “National Historic Reserve,” though I couldn’t really figure out what that was. On arrival, I was shocked at how foggy it was – visibility of under 100 yards, I’d say. I waited a little while for the fog to clear inside a Starbucks while I planned my route. First I went to Deception Pass State Park (the most popular state park in Washington), which is quite nice – it has some beautiful beaches, dense forests, and a nice mountain/hill. The pass itself features, bizarrely, turquoise water. I hiked to the top of the mountain and could see two jets from a nearby airfield maneuvering. I say “see,” but mostly you could hear them, the noise was immense. Apparently it’s routine to do these sorts of drills at night, which must be fun for the residents. There’s a large military presence throughout the Seattle area – Navy and Coast Guard in particular. I continued hiking around Deception Pass, through what appeared to be a temperate rainforest and along the shoreline. The problem with many of these state parks is that they don’t have the sort of contiguous hikes I look for. A park might have 30 miles of trails, but when each trail is 1 mile and they sprawl all over the park, it’s very difficult to piece together the 10+ miles of hiking I’d like to do. I spent the night at a Wal-Mart on Whidbey because all the parks were full – this in the middle of the week – and the next morning visited Fort Casey, on the southern tip of Whidbey Island – Port Townsend is just visible from it. This was the biggest set of the ubiquitous fortifications that I saw. Most of these date from the very beginning of the 20th century, before they were rendered obsolete. There’s nothing imaginative about them, they’re simply poured concrete blockhouses, searchlight emplacements and watchtowers. They look like a prison, or Stony Brook University. A lot of the grounds – owned by the federal government – were used for training soldiers during the second world war. The guns were almost universally melted for scrap during the same period. At Fort Casey, they did have two guns still there – huge 10″ cannons. In an interesting coincidence, the rifling in the barrels was produced in Watervliet, just half an hour from where I grew up. Quite a journey to end up in the other corner of the country. There was also a nice lighthouse, also rendered obsolete and rescued from decades of neglect in the 70s. In the end I spent a bit over a week in Port Townsend. I had thought of doing some camping, but the campgrounds around town were full – and incredibly expensive to boot. In the summer the prices seemed to be $35/night. To camp! Instead, I parked near a friend’s house and was able to have continuous internet access, electricity and showers. It was a nice refresher from scrounging for these ‘necessities.’ Thanks, Nancy! After Port Townsend, my goal was to head to Portland via the main south-bound interstate, I-5. This entry was posted in Uncategorized on August 16, 2013 by rob. Over the past few years, I’ve slowly developed a method for getting to know a city. This method has been honed in Dresden, Reykjavik, Cologne, Hilo, Amsterdam, Munich – and now Seattle. I’ve grown to realize that I have unusual interests in cities. I dislike tourist areas (just as every New Yorker hates Times Square). I like museums, but only for a couple hours a day, max. I don’t like bars or nightclubs. Cathedrals are nice, but how long can you spend looking at them? Mostly in cities, I like ruins, city parks, and seeing typical neighborhoods. Sadly, there are no ruins in the US outside of Detroit. My method is to locate some landmark (museum, cathedral), and then wander in the direction of that landmark. I always walk, unless it’s many miles and public transit is available. There of course a variety of ways to explore a city – bus, streetcar, subway, car, train, duckmobile, boat, bike – but walking is what most agrees with me. Usually I get lost – unless I have a street-by-street map. I remember getting incredibly lost in the middle of the night in Dresden, trying to find some landmark to recognize where I was. It was a bit stressful, but I think it’s useful to get lost sometimes. It’s good to be able to figure out where you are. No matter how lost you get, you can eventually find yourself. It just takes time. Lately I’ve started carrying a compass with me in cities. That’s not something you see much, orienteering in cities, but it’s a good deal more precise than dealing with the sun. I arrived early in the day in Seattle. I had no interest in seeing Pike’s Market, the Seattle equivalent of Times Square (I’ve been there too many times already), but was considering seeing the Science Fiction museum, near the Space Needle. I parked nearby and quickly decided the area was too touristy. Instead, I headed over to the shore to see the Olympic Sculpture park… a park filled with sculpture. This park has the same refreshing post-industrial feel as the Highline in NY, but was much less crowded. I don’t have any idea how to judge modern sculpture, but I get the sense that most modern art doesn’t have a “meaning,” but rather is designed to evoke an emotion or create an experience. By this metric, there were many successful sculptures: a twisted metal ‘eagle,’ a submerged house where you could walk on the roof, a crowd of enormous rusted metal curves, swimming along the ground like a school of fish, a little wooden boat next to a wall of waves. After this I walked along a bike path, through a train yard, and into the Queen Mary neighborhood, where I proceeded to get thoroughly lost. Seattle, like all major cities, has a lot of neighborhoods. But it’s a much more fragmented city than most – bisected by a major highway (I-5, always filled with traffic), with lots of lakes and bays and rivers. It’s a hilly city, too, and there’s very few high-rise buildings. It makes things diffuse. Couple that with the fact that few of the neighborhoods I saw were mixed-use, and you end up with a city whose residential areas feel like dense suburbs rather than city streets. Queen Anne was mostly this suburban feel, tidy cottages each with their own little garden and yard. It was fun to walk through once, as a tourist, but I don’t think Seattle is a walkable city. Bikeable, maybe, but a car almost feels like a necessity. I think most residents feel the same, because the traffic is pretty bad. After getting lost, I grabbed dinner at a biscuit restaurant with a childhood friend. We both had pizzas (I had pizza with Yukon Gold potatoes on it. Verdict: tasty, but the potato slices were a mess to eat). Then I headed over to a college friend’s place to finally shower (Thanks, Pia). She and her partner had a few people staying over so we all chatted for a while. The next day I decided to check out two parks: Volunteer Park and Washington Park. Both of these are east of Lake Union – they’re not far from one another. Volunteer Park is pretty small, and is famous for having been designed by Frederick Law Olmstead (who also designed Central Park). It’s a nice square park, measuring a few blocks on each side, and it contains the Seattle Asian Arts Museum, which was having a ‘free day’… so I figured I might as well check it out! This thing is painted from the inside! There were some cool exhibits, but what stood out the most for me were snuff bottles. There was a whole wall of them, and reading the display, it turned out the some of the bottles were painted on the inside, like a ship in a bottle. There was a variety of Indian, Chinese and Japanese art here. Then I headed northeast towards Washington Park. Much of the park is an arboretum, with a huge variety of trees: carefully tended rhododendron gardens, woodland forests, Australian landscapes and more. I headed north, and eventually passed underneath a highway, emerging in a wetlands area. This section of the park was a amazing: wetlands, with lots of little nooks and some floating pathways – it was trippy walking on cement blocks which sat on bouys that shifted with each step. I’ve spent a lot of time on wooden docks that moved, but cement has always been solid under my feet. This part of the park was near scenic Union Bay, and right across the water was the University of Washington stadium. I’d really recommend checking this out. As I headed south, I began to see a lot of blackberries, so I grazed and ambled along until I reached the highlight of the park – a Japanese garden. Admission was $6, but for me, it was well worth it. The garden was compact but elegantly organized. Planning a Japanese garden requires deep creative thought. I remember my grandfather describing how he’d laid out his own backyard according to some of the Japanese principles. For instance, if you have a straightaway, put something interesting at the end to draw people forward. I’ve read a few books about designing these gardens, and I wouldn’t mind trying it myself. This garden had a koi lake, a tea house, beautiful bridges, a waterfall, and some incredibly well-tended trees, all in a compact space. The trees were all essentially human-sized bonsai trees, carefully trimmed and staked out with wire. They were meticulously maintained and aesthetically perfect. In all, I walked about 25 miles in Seattle over two days. I like the city quite a bit – it’s literally a green city, people are friendly, and there’s a lot of cool things to do nearby, but it doesn’t seem practical to live in. I know that 600 thousand Seattlites may disagree, but if I’m going to live in a city, I don’t want to rely on a car, and the sprawl of the city means a car is critical. After Seattle, I’d spend a week relaxing on the Olympic peninsula before continuing my journey south towards California. This entry was posted in Periodic Update on August 9, 2013 by rob. Mount Rainier lies about 3 hours from Walla Walla, and roughly marks the start of stereotypical Washington ecology – the huge pine forests and mountains. Mount Rainier is a 14,000 foot volcanic peak in the Cascades; it’s dormant but not extinct, just like Mt St Helens. What’s interesting about it is how it dwarfs the surrounding mountains, which are in the 7-8 thousand foot range. The mountain actually changes the climate around it, creating a huge amount of precipitation, a rainshadow, and so forth. It’s typically wreathed in a layer of clouds. This mercurial weather produces a cornucopia of biomes: alpine, sub-alpine meadows, mountain forest, rainforest, box canyon, primeval forest, classic northwest forest. The park is mostly inaccessible in the winter – it’s only in the summer that all the roads are open. The park is divided into four sections – a dirt road-only NW section, the main section in the SW, an old-growth section in the SE and a rockier section in the NE. On my first day I arrived at 2pm and claimed a site in the Ohanapecosh campground (a fun name to say! ), where I would spend two nights. Then, I headed to the visitor center at Paradise. This was the diciest driving so far on my trip, I think, as the road gains massive amounts of elevation and winds along the rocky edge of the mountain. Mount Rainier receives vast numbers of visitors, and of the parks I’ve visited so far, it’s the least able to handle the load. I arrived on a Sunday, and it was crawling with people. The Paradise visitor center, which is quite remote, had three full parking lots, and I felt lucky to find a spot in a nearby picnic area. I got a map of nearby trails and decided to try a strenuous one, the 5.5 mile Skyline loop. It was 3:30 and the average time for the trail was four and a half hours, so I figured I’d finish just as it got dark. As chance would have it, I chose the wrong direction for the trail – the side of the loop that went straight up. This proved to be a good challenge. I the trail gained 1700 feet of elevation over what I estimate was 1.5 miles. The grade was slightly less steep than a set of stairs, and the first half mile or so of the trail was partially paved with asphalt. As I gained elevation (the visitor center was around 5500 feet above sea level), the vegetation grew sparser and eventually nearly disappeared. Snow, packed down by the crowds, began to appear, and I entered a layer of clouds – hiking in the clouds is an awesome experience. Sometimes the trail disappeared into the snow, and I had to cautiously edge my way up the mountain. I went through this first part of the trail in about 45 minutes, without any breaks. I was breathing heavy and sweating a bit at the end, but would have felt comfortable continuing. I was really happy about this; it was a good indication that I’d finally gotten my “trail legs,” and was adjusting to the stress of hiking. At the highest part of the loop I was greeted with some surprise guests: two marmots grazing on the subalpine flowers. These woodchuck-like creatures had a neat brown/white coat and were fearless around people. So far on my trip, I’ve already seen most of the wildlife I’d hoped for: buffalo, elk, deer, marmots, heron, moose, quail, turkey, prairie dogs. No bear yet, and that’s fine with me! The surrounding Tatoosh mountains, seen from the trail. You can see cars parked along the road. The trail began a leisurely descent, and I passed through extensive patches of snow, some of which I had to slide down because I couldn’t get a good grip with my boots. This part of the trail was beautiful, the plants a shimmering green, and there were fields of tiny flowers. I could see why the area is known as Paradise. The sad part, though, is that although the trail is well-constructed (it’s lined with stones), there are huge tangles and braids of side-trails that mar the landscape. The park has put up signs and urges people not to be “meadow stompers,” but it doesn’t seem to do much good. And it’s tough to control people way up here on the mountain. I completed this loop in two and a half hours, which I was quite pleased about, as it was almost half the average time and would have been a decent pace along flat ground, let alone a mountain. The next day, I decided to try something different, and stayed near the campground. This time, I hiked to the “Grove of the Patriarchs,” a small island filled with enormous ancient trees. Some of these trees are one thousand years old and 300 feet tall. I went early, and was alone with the trees as the fog lifted in the cool morning air. The trees are astonishing and humbling; now I can only wonder how the Redwoods compare. The grove is a short hike – just over a mile – but there’s a turnoff for a longer hike, the East Side Trail, which I took. This felt like a totally different park from the day before: first the raw, primeval forest, and then traditional Pacific Northwest pine forest. I did an easy 14 mile out-and-back hike. Back at the campsite I got to test out my new stove setup. I’d been using a basic Swedish army stove, but the supports around the burner were designed to work with only a particular pot, and not normal pots and pans. In Missoula, I’d found a bracket at a hardware store that would serve as a more generic support. It worked pretty well, and I cooked up an omelet for dinner. My final full day at Mt Rainier I moved to the White River campground in the northeast of the park. I started and finished a book (With the Old Breed: At Peleliu and Okinawa, a memoir of WWII on the Pacific front, which I highly recommend). I felt lethargic. It’s amazing how simply getting on my feet now gives me a lot more energy. I ended up doing a 10 mile out-and-back hike along the Wonderland Trail, a 100 mile loop which surrounds Mt Rainier. I was interested in doing an overnight or two on this loop, but the park has encountered unprecedented interest in this trail, and it’s difficult to get a permit for backwoods camping. The scenery here was much the same as the day before, with the exception, at the beginning of the hike, of a stunning view of Mt Rainier near the White River. This, though small, was actually the most vicious river I’ve yet encountered. It’s literally white, apparently due to some mineral runoff and probably the rapids; it’s narrow and deceptively deep, and quite rocky. There’s a primitive log with a guiderail over the river. When I completed my hike, I talked briefly with a man standing next to the bridge. “I wonder how many people cross this river without thinking about how close they are to making a mistake and ending it all,” he said. I guess we agreed on that, but it was a macabre discussion that I didn’t want to have before crossing to the other side of the river! This entry was posted in Periodic Update on August 5, 2013 by rob. After Yellowstone, there’s a gap until reaching the next logical stopping place. You travel through parts of Idaho, Montana and Washington – nice states, to be sure – but there’s no “major” parks along the way to Seattle. Not until you hit Mt Rainier, which I made my target. The three parks which I selected to visit were roughly on a straight line (as the crow flies) between Rainer and Yellowstone. They were: Big Hole National Battlefield Park, Nez Perce National Historic Site, and Whitman Mission National Historic Site. Although they lie in roughly a straight line, the non-interstate highways in this area are anything but straight; they are forced to conform to topology as they wind along various rivers and navigate huge mountains. My first move after Yellowstone was to travel into Montana, and then up the distorted western border of the state to Missoula. Along the way, I planned on visiting two sites: Big Hole, and a state park, Bannack, which was the first capitol of Montana, and which featured a mining ghost town. Unfortunately, the state park was closed (a fact I only discovered when 10 miles away). Fortunately, Big Hole was not far away. Montana towns, by the way, are quite nice. I felt there was a tidiness to these towns that was unlike those in other states. They always seemed well-organized, even with just a few thousand people, and I quite enjoyed my limited time in the state. The other amazing thing about Wyoming and Montana was highway repairs: on the East coast I’m used to some really botched repairs, many of which amount to globs of asphalt thrown haphazardly in the direction of potholes. But in these two states, the repairs were surgical – you could glide over them and hardly feel a bump. I don’t know whether this was due to climate peculiarities or the competence of the workers, but it was a welcome change. There are huge parks like Grand Teton and Yellowstone, and then there are tiny, mostly unknown sites, such as Big Hole National Battlefield. This marked an early battle in the Nez Perce War, and although minor in absolute terms was historically significant. I say minor in absolute terms because of the amount of people involved: 200 US soldiers and 800 Nez Perce (including 200 warriors). As someone most familiar with Civil War battles, which could involve 200 thousand people, I found the tiny size of the battle remarkable. Also interesting to Civil War afficionados, many Civil War officers re-appear in the Indian Wars, so you see familiar names and faces (in this case, O.O. Howard and John Gibbon). The famous Custer, incidentally, was an unlikeable Civil War cavalry officer who became an unlikeable Indian fighter before being obliterated. The battle itself was depressing, a night attack on the sleeping Nez Perce camp with the customary slaughter of women and children (soldiers were ordered to “shoot low, because they’ll be sleeping in their tipis.”) The Nez Perce, although initially surprised, organized a resistence, repulsed the soldiers, and then were able to continue their flight. Most curiously, the night before, many of the Nez Perce warriors apparently wanted to post sentries and were shut down by one of their leaders. After hiking a few of the short trails around Big Hole, I hopped in my car and headed to a hotel in Missoula, about an hour and a half away. Missoula lies near the Bitterroot Mountains, a set of mountains that lies in an unusually straight and regular line extending South from the city; you travel alongside these mountains to reach it. It’s a small city, just 63 thousand people, and although much of it has the usual suburban blight, the core part of the town feels very much like a Pacific Northwest city, with coffeeshops, microbreweries, bicycles, and so forth. This, despite the fact that Montana is not something I typically consider Northwest. The small downtown section which I saw felt very walkable (I saw, briefly, the Missoula Celtic Festival… my tolerance for bagpipes is about 3 minutes). My biggest problem with the city was the fact that, like small midwest towns, it retained a significant amount of diagonal parking spaces, which are wonderful in one-road towns. In larger cities, they seriously obstruct the view of traffic and make driving across main streets a hazardous gamble. After spending the night in Missoula, my next stop was the Nez Perce National Historic Site in Idaho. The speed limit is 50 miles per hour, but there’s no way to sustain these speeds. You are forced to reduce speed for cornering at anywhere from 20-40 mph at least 4 times every mile. However, some people will fly along these roads and tailgate you so you have to pull over at infrequent turnouts. Sometimes you will encounter an RV which will not allow you past, which you must suffer behind for tens of miles (sometimes with a tailgater pressing you to pass in rare passing zones). There’s no shoulder on the roads, and they’re claustrophobically narrow. One side of the road typically terminates in a cliff wall and the other with some river or sheer drop of hundreds of feet. The whole time you drive these roads, you worry about people coming around corners and drifting over the double yellow line, which some cars do, if they’re traveling too fast. I’d estimate, at this point, that I’ve driven about 1000 miles on such roads, and I’ve grown to loathe them, including 200 consecutive miles through Clearwater National Forest in Idaho. I’ve discovered, with some surprise, that the single biggest predictor to how comfortable I am on a road is the width of the shoulders. No shoulder means discomfort; just 2-3 feet of shoulder and I’m typically fine. Anyway, I finally reached Nez Perce National Historical Site. This ‘site’ is actually a disjoint set of sites – various pullouts along the road that form a constellation of traditional Nez Perce lands and sites where they were hounded to death by US soldiers. The administrative center was in the nothing town of Spalding, Idaho. I would not recommend this park to anyone. There’s a small museum in the visitor center, and a 25 minute video that was assembled in the mid-eighties, to judge by the clothing. The narrators and even interviewees of this video were clearly reading from a script, stumbling over the words. Although the visitor center was tidy, it was located in an empty, sun-baked field that must have been 95 degrees. I watched the video and then left immediately, glad to be in the cool AC of my van. Spalding is right on the border of Washington, and after stopping in Lewiston (right next to Clarkston, get it?) for lunch I continued through Washington. The only thing notable about Lewiston was that I drove right through a forest fire – there were emergency vehicles on the road, and a helicopter dropping a bucket into the river about 100 yards from me. The smoke from the fire sprawled across the road, darkening my path and turning everything an eerie yellow. It was a unique experience. As is so often the case, the Idaho/Washington border marked an immediate transition, and I entered a huge swath of wheat fields. I’ve never seen anything like it – these were literal mountains of wheat, the ground covered with a mono-crop even more consistent than corn in Kansas. This continues for a hundreds of miles in southeastern Washington, and is totally inconsistent with my mental image of the state. I spent the night in a Walla Walla, Washington, Wal-Mart (population: 30k). Wall Walla felt like the husk of a mall, when the building is intact but the stores have left. There was a downtown, but it was deserted, and even the strip was depressing. The nearby college looked like a purely vocational school. But it turns out there’s a neighboring town, “College Place,” which is where I found the Wal-Mart, and chain stores that showed some semblence of life. Around the town, the monoculture subsides somewhat and there are some vinyards as well. The attraction near Walla Walla was Whitman Mission National Historic Site, which is notable as one of the rare locations where Indians slaughtered white people (though this slaughter of 13 was not really comparable to the 90 Indians massacred at Big Hole). Before the slaughter, the Mission had been an important stop on the Oregon Trail. Got to walk along the Oregon Trail. Didn’t die of dysentery. If Nez Perce was a dismal site, Whitman Mission was delightful. It’s just 96 acres, but it had a small museum, a nice view of the foundations of the mission, and an incredibly professional video. I’m not joking, it had the single best video I’ve seen at a National Park Service site. It must have been filmed within the past year, it was Hollywood quality, and it was filled with the insipid drivel some of these videos spew. The site was quiet and cool when I visited in the early morning, and the history here – of misunderstandings between Indians and settlers that led to tragedy – was quite moving. I’d strongly recommend this as a stop for anyone traveling through southeast Washington. This entry was posted in Periodic Update on August 4, 2013 by rob.